The Decay Tree feature in Nucleonica’s Decay Engine++ allows users to see and investigate all possible linear decay chains resulting from the decay of a radioactive nuclide or nuclide mixture. This feature is very useful when the decay process is relatively complex. It is particularly useful when fission products, resulting from spontaneous fission, are involved in the decay. – A particular daughter of interest (e.g. 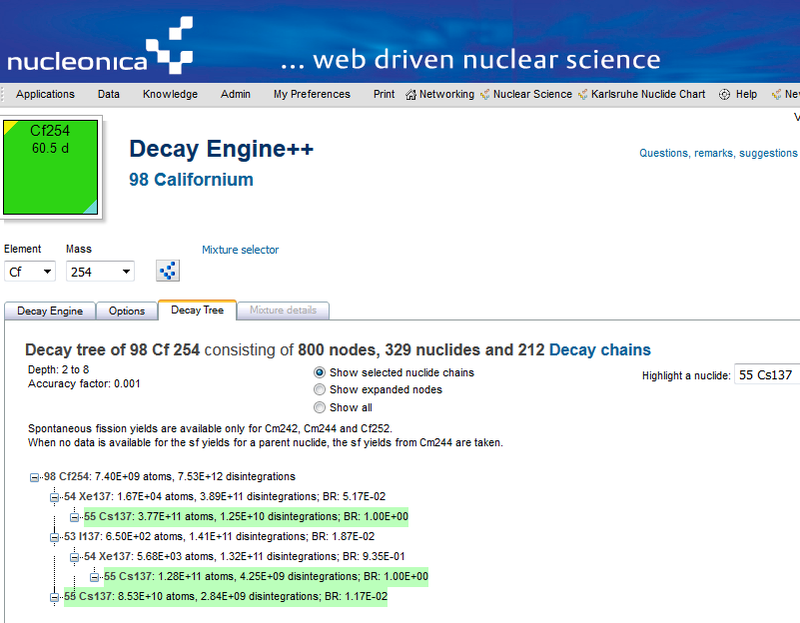 Cs-137 resulting from spontaneous fission) can be selected from the “Highlight a nuclide” drop-down menu. Of course any other daughter product can be selected from this menu. – Additional information can be shown by clicking the radio buttons “Show expanded nodes”, “Show all”. 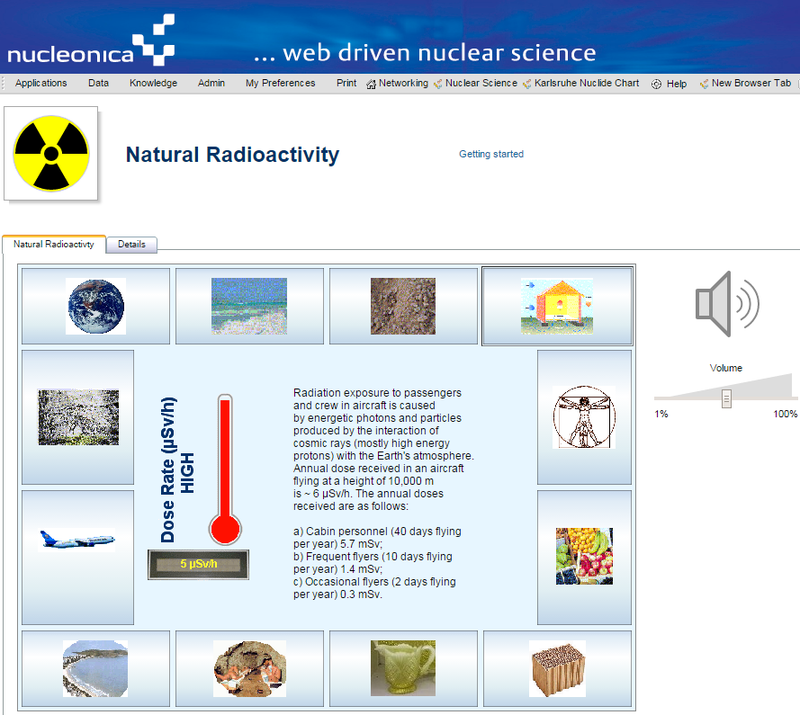 Nucleonica’s Natural Radioactivity Applet has been rewritten as a standard Nucleonica application to replace the Java applet version. The application is an educational tool to provide information on the radioactivity of everyday materials. – The application is no longer a Java applet and it is therefore not necessary to install the Java runtime environment. – the application runs directly is most modern browsers, in particular Chrome, Firefox, Internet Explorer, Safari etc. – The application consists of a number of images of everyday materials, locations, etc. On placing the mouse over the image, information on the radioactivity and dose rate are given qualitatively in a central panel. Additionally, an acoustic signal is given corresponding to the level of the radioactivity (low, medium, high). – Clicking on an image will lead to further information shown in a pop-up window. – The wiki page gives further information together with relevant references to the information shown.